Aquariums tend to run to the boring side. Let’s be honest. There just isn’t going to be as much interaction with pet fish compared to dogs, cats or even hamsters. That being said, no one’s really stopping you from decorating your fish crib, is there? If you want to give your creativity some free reign and give your fishes a little bit more to look forward to and alleviate the boredom of swimming in limited space for hours on end, then these unique aquarium products may help you. Click on each product name hyperlink to read its detailed review. Children adore SpongeBob. And if we’re being honest, a good number of adults do, too. The above ornament features SpongeBob’s pineapple home from Bikini Bottom. It measures around 6 inches and is made of resin that’s safe for children and pets alike. It adds a nice whimsical feel to any aquarium. I wouldn’t really recommend it if you have large fishes but anything that’s 2 inches or less shouldn’t have any problems swimming in and out of those cute, round windows. 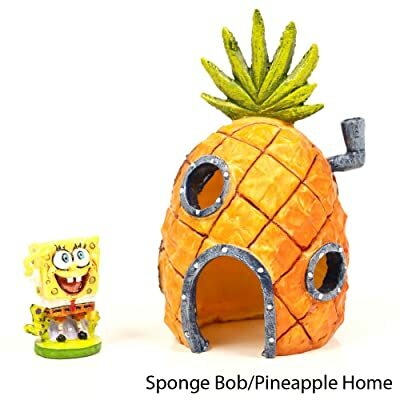 And if pineapples are not your thing, there’s a whole host of other SpongeBob-themed aquarium ornaments you can choose from, too. If you want your aquarium’s look to mimic your pets’ natural habitat, then it’s almost a given that you need to find some reef-looking ornaments. This Exotic Environments Caribbean Living Reed Aquarium Ornament fits right into the bill. 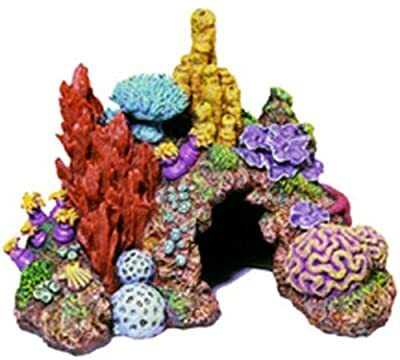 Made by Blue Ribbon, this colorful reef replica just need to be attached to the air pump and it will give off some nice bubbles, too. It’s non-toxic, made from a poly-resin material and safe for terrarium, saltwater and freshwater set ups. Blue Ribbon is a popular brand when it comes to aquarium products. 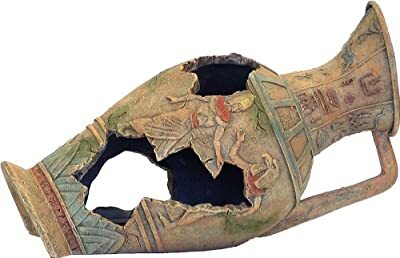 And they take décor to a whole new level with this Exotic Environments Egyptian Vase Aquarium Ornament. It adds an air of mystery to your tank. Your fish will absolutely love it. Just be mindful of the jagged edges, and if you have the time, file them a bit for safety. Pirate themed aquariums are nothing new. But they would all benefit from having this grinning pirate skeleton thrown into the mix. It’s actually an aerator. 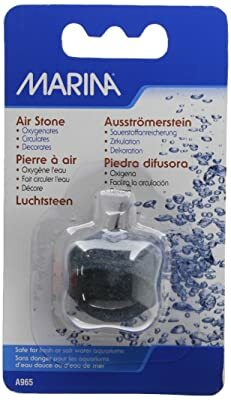 All you need to do is connect it to the air pump and you can start watching it spin the wheel while sending bubbles up. It’s a lightweight product that needs to be weighted down with gravel or stone, this durable plastic skeleton adds character to your tank while agitating the water at the same time. 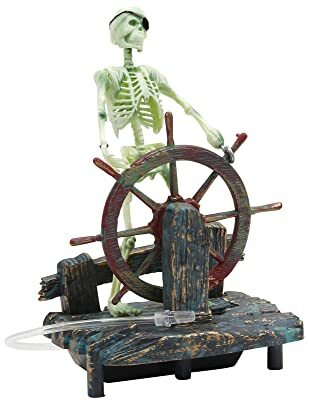 The Elite Air Stone Aquarium Décor doesn’t have as much character as the pirate skeleton. But it does produce much finer bubbles. Finer bubbles equal more oxygen in the water. And more oxygen is always better for your pet fish. With this one, you get to increase the surface water agitation, accelerate oxygen replenishment and help release carbon dioxide build up in the tank. Not bad for a tiny stone product. Now, this is what I meant when I say unique. 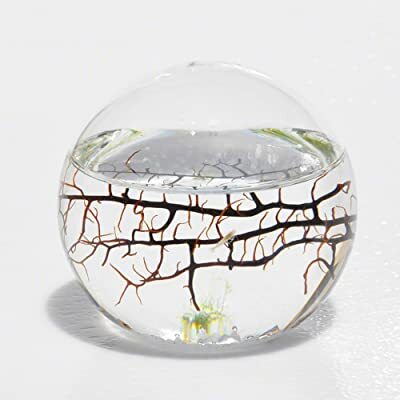 The EcoSphere Closed Aquatic Ecosystem is not only pretty and quite original to look at, the fact that it’s a closed sphere pretty much means it’s a self-contained and self-sustaining product. You basically get the tank/sphere, shrimp fish, algae and bacteria with what you pay for. And all you need to do is place it where it can get some light and you won’t have to bother with maintenance and clean up ever again. The Hagen Fluval Accent Glass Aquarium doesn’t look unique in any way. 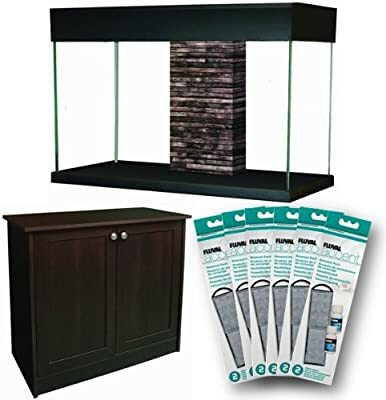 But the 25 gallon aquarium come with an espresso stand and 1-year renewal kits and for its price, one of the better, cost-friendly and classy start up kits you can find. And that’s unique enough in itself. Many brands cost the same but come with so much less. A 25 gallon glass aquarium with espresso trim. The aquarium cabinet with Integrated Water Change System. Finally, here’s something you might not think you need but you definitely do. 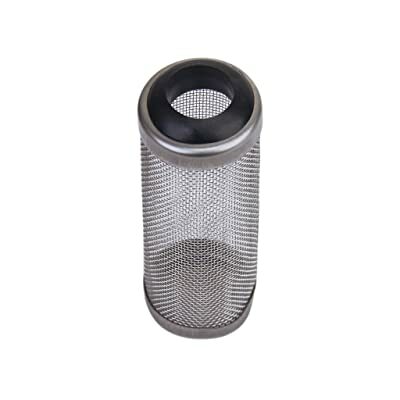 The mesh filter protects your tiny aquarium inhabitants safe from being sucked into larger strainers. It’s worth your money!! !